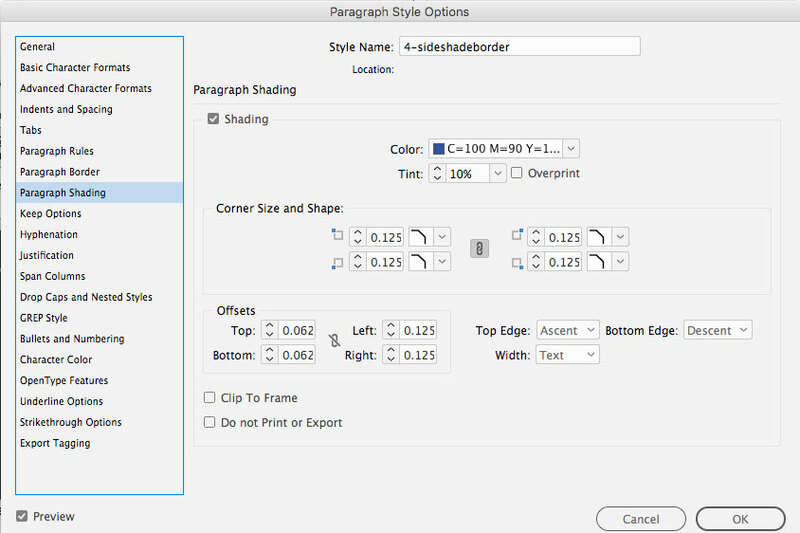 I’ve waited a long time to write this: InDesign CC 2018 adds borders to shading! This is one I’ve been pushing for over the past decade or so. I was excited when they added paragraph shading. I never could understand why the borders weren’t added at the same time. Regardless, the InDesign team added them for this update. This has always been a major hassle in ePUB design. Sidebars simply don’t work in ePUBs—realistically speaking. I’ve written a lot about how multiple columns are simply not practical in a reflowable design—which is likely to be viewed on an iPhone. This is especially true in our major market: Kindle. However, it remains to be seen if KDP will display this new feature. I hope so—and plan to bug them about it if they refuse. It’s a well-done feature. It works the way you expect. 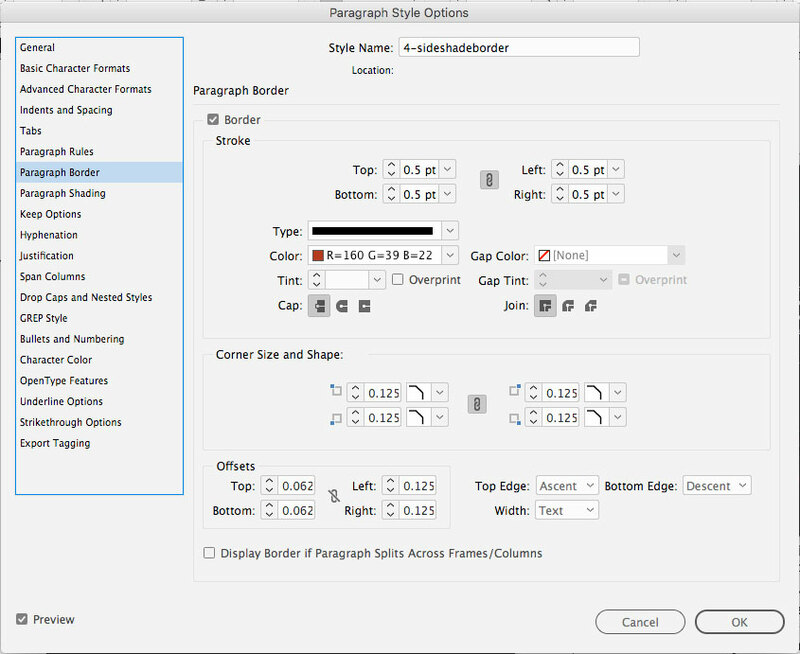 The only problem is that with corners and borders, you will need the same four styles which were required by the original paragraph shading feature. In addition, the borders require more attention than simple shading requires. Setting up the shading: As you can see, I used a 10% tint of a dark purple for the shading. I added eighth inch beveled corners. Finally, I offset the shading a sixteenth of an inch top and bottom, and an eighth inch left and right. Because the copy is justified I set the shaded box with the Width: Text. If I want the shaded box the width of the column (as in the featured image above): I change the indents of the text to fit inside the box. Setting up the border: I used the same set up for it as I used for the shading, with a .5 pt stroke. The problem shows up when you want multiple paragraphs within a bordered and tinted box. This requires a bit of a delicate dance. For this you will need three more styles. I added extra space before and after the paragraphs on the next page so you could see them separately. The top & bottom styles work with two paragraphs. Any of the styles can be used when a paragraph splits across frames [I don’t use multi-column frames at all for the mostly single-story books]. Top Style: Corners and borders at the top and sides, with a simple non-cornered, non-bordered edge on the bottom. Style for middle paragraphs: Here all you need are the side borders, with no corners. 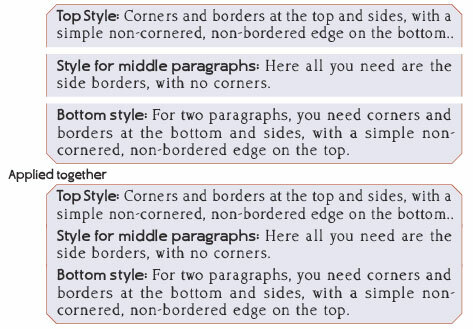 Bottom style: For two paragraphs, you need corners and borders at the bottom and sides, with a simple non-cornered, non-bordered edge on the top.